'Abdu'l-Bahá's Journey in the West . . .: September 14, 1921 Applause like an earthquake! Chicago, Illinois; a walk near Lake Michigan; Theosophical Society--applause like an earthquake! Excitement and transformation--beyond belief. If the Blessed Perfection had not exerted Himself to raise up the Cause of God, the Cause of the Primal Point [the Báb] would have been completely effaced. Similarly, had it not been for the power of the Covenant after the ascension of the Ancient Beauty, it is evident what the people would have done, how they would have spent their time, like Mírzá Yahyá, taking many wives and satisfying their lusts and desires. They would have destroyed the divine standard. He then gave an account of the fruitless Kheiralla. All the affairs and conditions of the world serve the Cause of God. If they had driven me out of the United States or had refused me entry, it would have been a good thing. Opposition serves to promote the Cause of God, how much more helping the Cause accomplishes! With this type of sacrifice they attained success. But remember, if he had lived, it would have been better for his nation and government. Observe, a general sacrificed himself and his children for the emperor and became renowned for sincerity and faithfulness. From this example it becomes obvious what we should do in the path of the Abhá Beauty. If you view it in the light of justice, you will see that the emperor did not bestow upon his general a thousandth portion of the grace that the Blessed Beauty bestows upon us. Returning to the house, He found several believers and seekers from Chicago and surrounding communities. All were grateful to hear His divine words and teachings. Gentlemen, today it is a great bounty and high honor for us to be in the presence of a person who is the greatest prophet of peace and harmony. There is no doubt -- and I feel and say on behalf of the audience -- that to the present time we have not had the honor of hearing the life-giving words from the tongue of a living prophet. 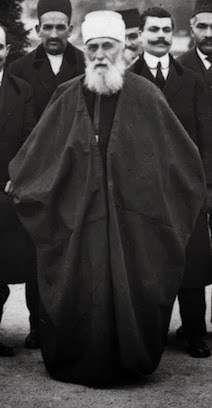 Therefore, with unbounded happiness and heartfelt honor I present to you His Holiness `Abdu'l-Bahá, the prophet of peace and the founder of universal brotherhood. The Master rose and spoke brilliantly about the distinction between spiritual realities and the animal nature of man, and the appearance of the perfection of man in the image of God. He explained some of the teachings of the new Manifestation. The audience applauded with so much excitement and joy that it felt as though there were an earthquake in the auditorium. I am very happy with your warmth and consideration. God be praised that there exist in America such societies founded on human principles, the appreciation of spiritual values and the investigation of truth. I am most grateful to this society and hope that your inner perception may increase and that the bounties of God will be with you. When the Master went into another room the people rushed into it. Most of them wished to tell Him, `We testify to the truth of this Cause.' The degree of excitement in the hearts of such a large gathering cannot be imagined. That such a transformation can occur in such a country is beyond belief." Mahmud tries so hard to describe something that cannot be described! It excites the heart just reading his words--but how much more to have been there! 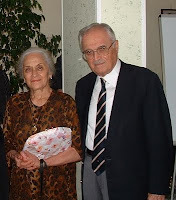 Tonight I received the news that Violette Nakhjavani has passed away. My grief was immediate and intense. Yet, I held her book in my hands and marveled at the fruits of her life. May she eternally be uplifted and circle around the holy ones! And may her dear husband Ali be comforted. In Montreal I realized there was a part 2 to her book on the Maxwells of Monreal! Amazing, really.